Air Force Lieutenant General Jim Keck, former Vice Commander of the Strategic Air Command, and his son Tom Keck, also a retired Air Force Lieutenant General and former commander of the famous 8th Air Force. Both were born in Providence; the senior Keck graduated from Cranston High School and attended Brown University for a year before graduating from West Point in 1943. He completed two combat tours as a B-24 pilot with the 8th Air Force in Europe, and eventually retired from the Air Force in 1977. 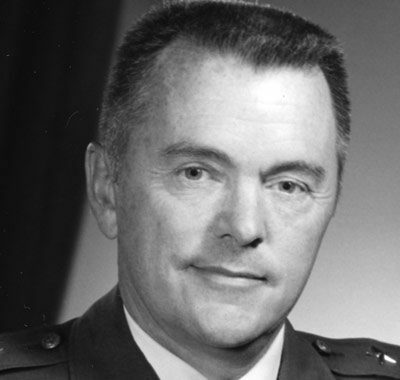 Tom Keck graduated from the Air Force Academy in 1969, and flew numerous B-52 missions over North Vietnam—some in the same aircraft his father had commanded. He retired from the Air Force in 2002 and now works for Raytheon in Tucson, AZ. The Kecks are also the only father-and-son Mach 3+ team in the world, having both flown at more than three times the speed of sound in the SR-71 Blackbird.